Are you a fan of Paw Patrol and have fish? 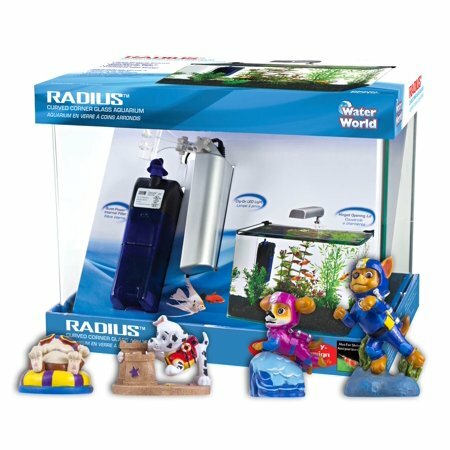 Check out the Paw Patrol Kids’ Fish Tank Gift Set on Walmart.com. Only $59.99, regularly priced $80.75 + Free 2-Day Shipping AND Free Store Pickup. Bring the fun and excitement of Nickelodeon’s Paw Patrol home to your aquarium with these Paw Patrol fish tank ornaments from Penn-Plax. This four pack of ornaments includes miniature sized Marshall, Rubble, Chase and Skye figures. Each ornament is meticulously detailed and painted by hand to capture your favorite character’s every detail. Officially licensed Paw Patrol fish tank ornaments; Includes Marshall, Rubble, Chase and Skye; Perfect for kids and adults alike; Hand painted. This aquarium has a unique bent glass design that is frameless and seamless in front for unobstructed viewing on all sides including top. Penn Plax Water World 5 gallon aquarium kit includes RADIUS Curved Corner Glass Aquarium, Cascade Internal Filter, LED light, Mat, and Hinge-Style plastic lid. Made with the highest quality glass for durability and clarity, and utilizes a 3 piece construction with seamless rounded front corners. Aquarium is suitable for a wide variety of fish. Penn Plax 5 Gallon Aquarium Kit measures 11″ high by 8 3/4″ wide and 13 3/4″ long.